Go to iTerm Preferences → Profiles, select your profile, then the Keys tab. Click Load Preset... and choose Natural Text Editing. 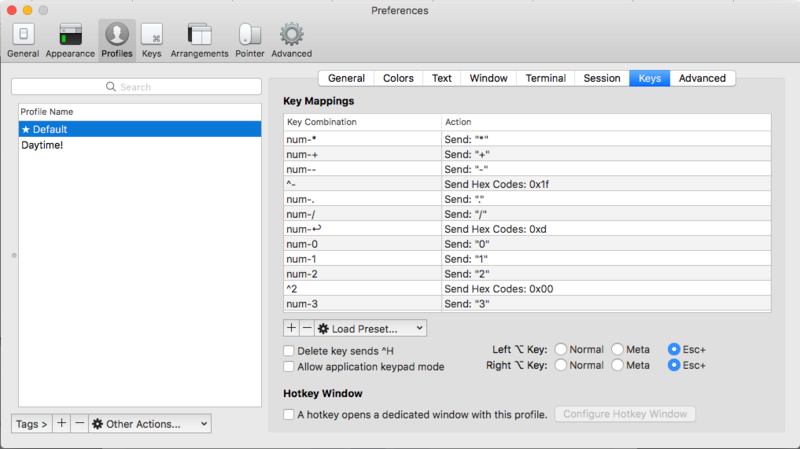 Go to iTerm Preferences → Profiles, select your profile, then the Keys tab. Find ⌥← and ⌥→ and set them to send escape sequence b and send escape sequence f respectively. If you use ⌘→ and ←⌘ you will need to remap the next and previous tab shortcuts which are set to those as default. Terminal uses ⇧⌘→ and ⇧⌘← for these. You can do this under Profiles, or just globally under Keys (shown below) if you wish to set it globally. Note that settings in Profiles override global settings in Keys. Change them to Send Escape sequence with Esc+B for backward and Esc+F for forward. Namely, see the Esc+ is selected. Not the answer you're looking for? Browse other questions tagged terminal software iterm . Why don't my arrow keys work in vim under iTerm? How can I move through words when typing a command in iTerm2? In iTerm, how can I change alt+delete to ignore slashes?